I’m late to the party, I know. I use to be punctual. Before giving birth. You could set a clock by me. Now you can’t even set your calendar. The minute my period was late because of my firstborn, it was all over. Punctuality wise. Punctuality. Period. Welcome to my corner of the world. Armpit, Florida. At Christmas time. This is not our house. It belongs to our neighbor. He decorates enough for the rest of the street. All we need to do is hang a simple wreath on the door. Anything more is overkill. This is my wreath. I made it myself. Me and my fabulous bow-dazzler. 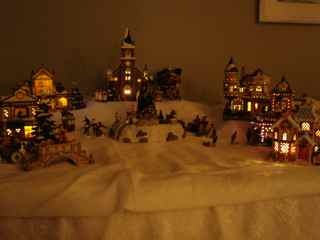 Behold my Christmas village. If it gets any larger, we’ll have to move. I spend the better part of my day cleaning hotwheel cars off the snow. The church looks very much like the one Fiddledaddy and I were married in. That’s us standing in front. I’ve never looked more svelte. 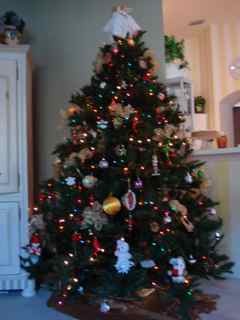 I love our tree. 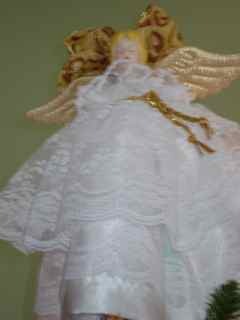 We found it at a garage sale before we had kids. Set us back $40.00. 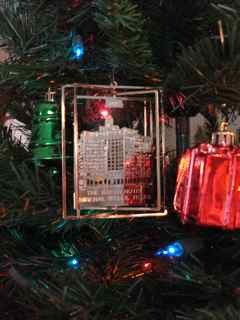 These days, it is only adorned with non-breakable ornaments. I birthed a climber on the third try. This tree looks good laying on it’s side as well. Just sayin’. My favorite non-breakable ornament. It’ a golden replica of the famed Baker Hotel in Mineral Wells, Texas. Much of my family is from there. The doors closed many years ago. It sits empty now. And is rumored to be haunted. A wonderful landmark. I spent many summer days there swimming in the pool when I was a kid. I don’t think it’s haunted. I think it’s just lonely. 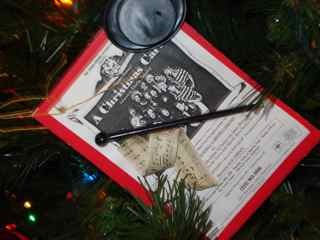 The producer of this play, “A Christmas Carol”, made these ornaments for the cast. Fiddledaddy and I were both in it. A hundred years ago, when we first started dating. The first time. I did the play in roller skates. Fiddledaddy was forced to wear tights. He looked really good in tights. The attraction was immediate. My precious mother-in-law made this for us right after we were married. I added the bow. Again, a bow-dazzler moment. I would love to serve y’all my Rum Balls. As long as you’re planning to stay awhile. hic. And take a look here to check out my clever Christmas card display. Thanks for stopping by. And thank you Boo Mama for hosting this bloggy tour. 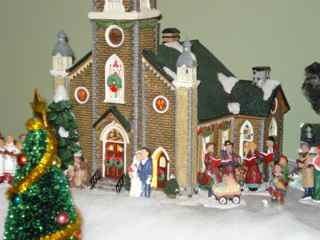 Looks great, I love the Christmas village, and you are so funny! Glad I stopped by! You crack me up daily! Thank you for your wit! Okay…seriously hilarious…we love your house (and your neighbors of course)! Hic! You make me laugh! 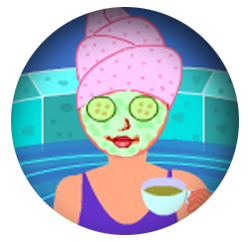 I enjoyed your post and pictures. Thanks for opening your home, it’s lovely – your tree is beautiful. And I agree with keeping the outside of your house simple due to the neighbors. We have their cousins living right down the street. From one Floridian to another: Merry Christmas! You have some serious bow-dazzling skills! Hey better late then never. Your home is lovely and I”m glad you have taken the time to share it with us. I think Armpit is quite lovely, at least your house is!! I’m getting very envious of that Bow-Dazzler. So do you even need to turn on your lights at night with a neighbor like that? I thought I saw a glow in the east last night, now I know what it was. And yes, trees can look amazingly festive doing yoga on the floor. And that’s when you get smart and make felt ornaments. I love your village. I just showed mine on my blog the other day. I have an outhouse with a little boy inside because if there is a way to trash a pretty Christmas scene I will find it. I’m just trying to figure out which character in ‘A Christmas Carol’ wore roller skates. Your tree is awesome, by the way, at any angle. Love the little Christmas village! Everything looks beautiful! Your Christmas tree is such a pretty shape — I just hate to see a skinny Christmas tree, but that one’s just right. Love the Christmas village! I think the neighbor may have too much time on his hands. Love your tree and love even more that it looks great lying on its side. Your kids must have been at my house. Either that or the kids must go to some sort of “how to get the most reactions from mom and dad” school while God was forming them. Love your tour. Oh, and from a fellow homeschooler, congrats on your blog. love the leopard bow in the wreath…can’t go wrong with that! Is it sad that there are absolutely no outdoor decorations on my block? Of course, I could do my part, but that’s the kind of collection you have build over a lifetime. I love your climbing tree and all the bows. I also enjoyed your card display. Merry Christmas! looks beautiful, thanks for sharing! Your Christmas village is lovely. Ah yes, Mineral Wells. If I were as rich as Bill Gates I would buy it and totally restore it to it’s former fascinating glory. I didn’t know you were from around here. I happen to think a tree placed on its side is unexpected and adds a bit of whimsey. Armpit, Florida has never looked so lovely. You are amazingly funny. I cracked up at that neighbor’s house and your tree looking good horizontally displayed. thanks for the tour. I love the village scene. We do one too and I love sitting in the dark with just the village lights on. So pretty. I enjoyed reading about your ornaments too. Love your post! It cracks me up!! I was about to freak out thinking it was your house in the first picture. 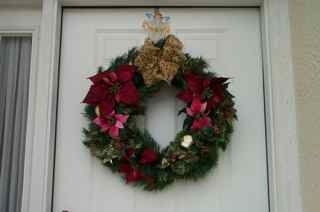 If my neighbor decorated like that, I’d just put the wreath on my door too. Also I have to tell you that there must be something about that 3rd child…mine also brought the tree down a few times last year as well. Hmmmmm. And…I grew up not far from Mineral Wells!! What a small world! Fun and funny tour. After the holidays are over and life settles back down (?) I plan to come back and visit more. Thanks for joining the tour! Your post is wonderful and your home is lovely, thank you for the tour. Merry Christmas, Karen. and I love your little town! If that whole Funniest and Grittiest Blogger thing doesn’t work out for you, I think you could have a serious career on QVC with your mad Bowdazzler skillz. 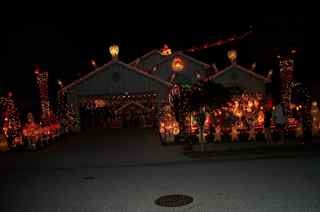 Wow, I think I saw your neighbors house on HGTV’s extreme Christmas! You had me giggling out loud. I’m a fan of a good bow-great job! 😉 Merry Christmas! I love your tree and that beautiful village! I’ll take one of those rum balls please. Seriously, you crack me up! As usual. Hot wheels on the snow village and Christmas trees on their sides. Sounds so much like my place. you are so funny! Thanks for the tour. I’m sorry that you know that you’re tree looks good on it’s side. Your decorations are very fun and functional, which is a combination I adore. Now tell me this bow-dazzler is a real thing and if so how have I lived the last 30 years without it???? You are one of my favorite bloggers. I always laugh out loud at least once while reading your posts. Your decorations are wonderful. Merry Christmas! I’ve been to that hotel in Mineral Wells. Have a great family pic we took on the front steps. Wouldn’t you have loved to have seen it in all it’s glory?! I heard it was haunted, too. I’d love to wander through it! You crack me up w/the “bow-dazzler”! Very pretty home and beautiful Christmas decorations. The bow-dazzler? I gottahavemeoneofthose. I’m making those rum balls tonight… as long as Honey remembers to pick up the rum. You are stinking hilarious! Lovin’ you tour, thanks! Your house is lovely and the church is to pretty. You look pretty good standing in front of it also. Gorgeous! We’ll have to go check out your haunted hotel in Mineral Wells one of these days.